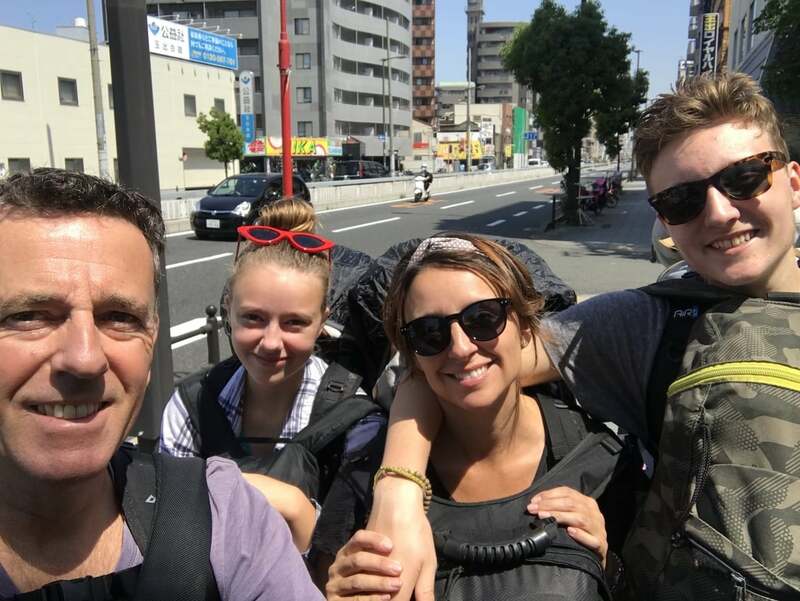 We traveled to Japan with our two teenage kids. 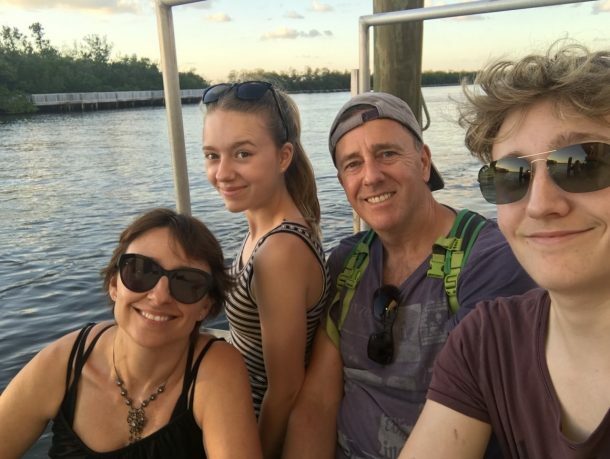 We backpacked around the country for a month and, because we were on a super tight budget, we were constantly looking for inexpensive but unique things to do. 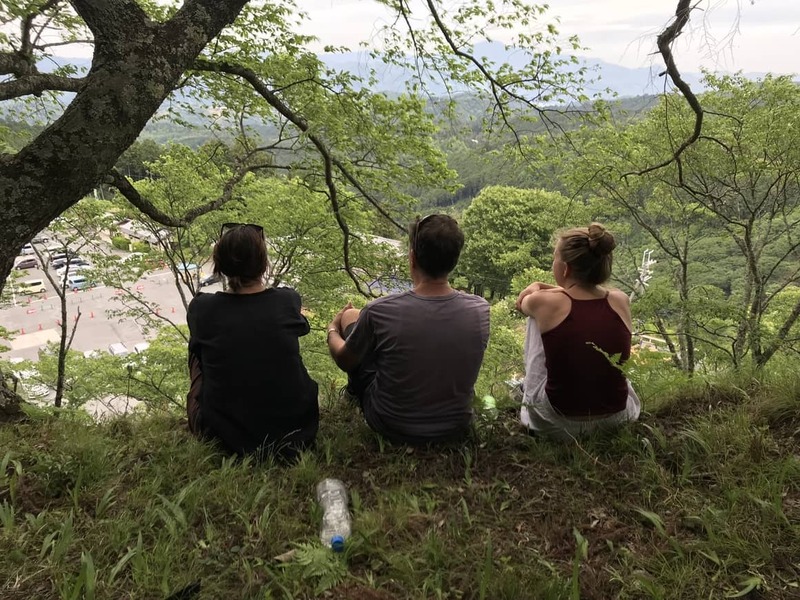 I spent weeks planning our trip to include experiences in Japan that other people might not have considered – or just didn’t know about. Now. Before I go any further I have to tell you something about our month in Japan. Yes, we were trying to see the country as inexpensively as possible, but, there were two things that we had to buy; come hell or high water. The first was the Japanese Rail Pass. This blew our budget so far out of the water that I had to throw a life vest out to try and save it. You cannot come to Japan and fail to experience the bullet train. Even if you only get a three-day pass – yes it’s extortionately priced but you will never regret it. I promise. 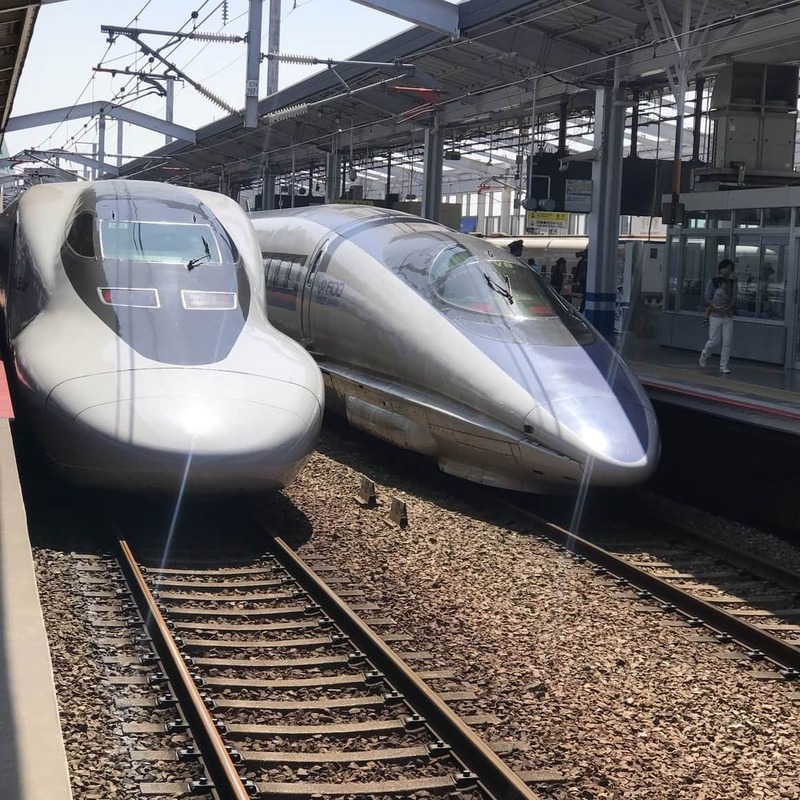 Yes, it will cost you half of your spending money but DO NOT miss the opportunity to travel on one of the Japanese bullet trains. The second was the wifi. Apparently, (so my techy husband tried to explain to me) the Japanese cell towers perform on different frequencies and not all cell phones work with a local SIM card. Before you freak out as I did (my 17-year-old almost had a heart attack) there is a perfect Japanese solution. You can hire a pocket Wi-Fi router. This is what we did and it was a lifesaver. You hire it from this company for about $25 a day, they deliver it to your hotel (or you can pick it up at an agreed location) and that is the end of your wifi problems in Japan. Ok then. Those are the two things that will cost you money but you can’t do without, next for the fun stuff! While in Japan, we couchsurfed, meaning that we stayed with local people, most of whom didn’t live in the main tourist areas of Japan. While sharing meals with our hosts we were told about things to do in Japan that we may not otherwise have found in guidebooks or on blogs. Which is always a bonus. And you know what they say; sharing is caring, so here goes! Are you ready to do things differently in Japan? Slurp Noodles To Your Hearts Content. Underneath Tokyo station, there is a labyrinth of cheap noodle bars all vying for your attention. Pick the one with the longest line of Japanese office workers – it will be the best, join the line and prepare yourself for a unique culinary experience. Once you are efficiently seated you will be handed a disposable, paper white apron. We were in total confusion as to what we had to do with them until we looked over to the table next to us. Then it made perfect sense. When the Japanese people eat their noodles and broth they turn into different people. Out with the quiet and serene, in with the Cookie Monster. It is wonderful. Especially if you are traveling with kids who can’t stand to be told to get their elbows off the table. Being able to slurp noodles is one of those things that surprised me the most about Japan. 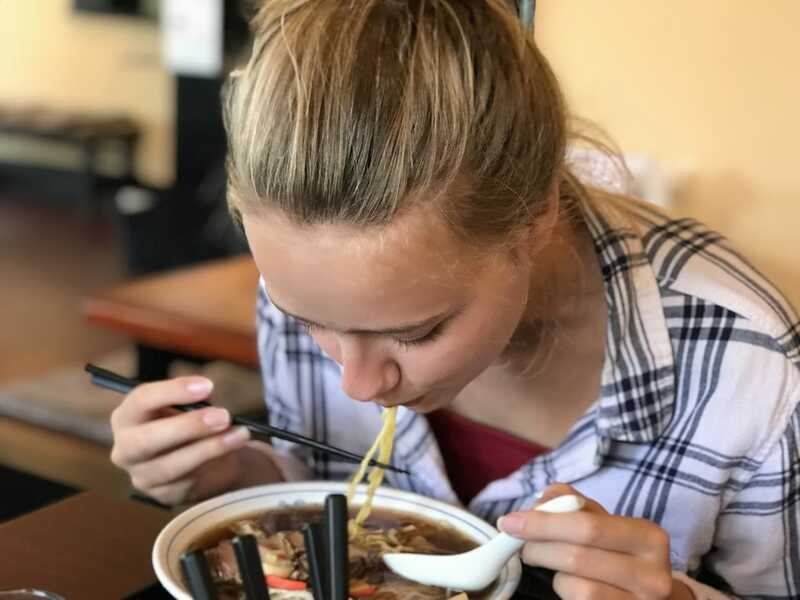 I knew about the noodles, obviously, but what I didn’t realise was that it is etiquette to slurp the delicious hot steaming broth as loud as you can in public. Life in Japan is very different from how I imagined it would be, and this was one of those experiences that took me by surprise. In a nice way, I might add. My teenage kids thought they were in heaven. There was me, telling them that Japan is super quiet and they must not raise their loud teenage voices, and then, they go into a restaurant only to discover they can eat like Shrek. My daughter. Her favourite thing to do in Japan was to slurp her noodles as loud as she could! It was raining on one of the days that we were in Tokyo. If, like us, you find yourself in the capital city of Japan, on a budget and with no desire to look around shopping malls, then head to one of the many English speaking cinemas located around the city. Don’t worry about finding one to suit, when I say there are loads I am not exaggerating. Check out this website that will tell you how to acquire cheap tickets for the movie you want to see. I cannot tell you what it is like to experience a Japanese movie house. You must go and do it for yourself. Is that an old fashioned word? Moviehouse? It sounds like something my Granny would have said, but anyway, the cinema. The Moviehouse. Huge bucket seats with a screen bigger than something big, the cinemas in Japan are worth a plane trip on their own. How wonderful not to have to worry about a tall person sitting in front of you, literally, your row of seats is on its own raised platform. 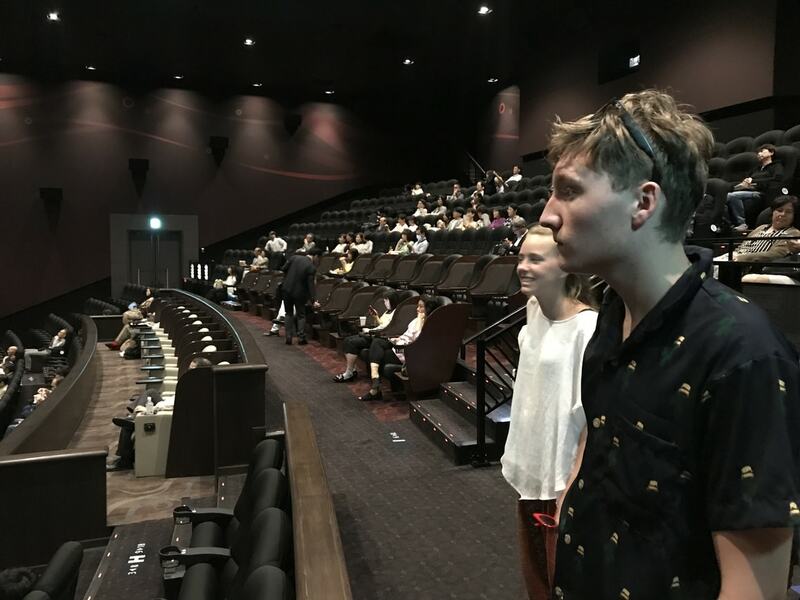 There are not many things that will stop my teenage boy in his tracks but the size of the screen at the cinema in Tokyo Japan did just that! Mt Yoshinoyama is famous for its cherry blossom viewing spot. The mountain is adorned with over 30,000 cherry trees. 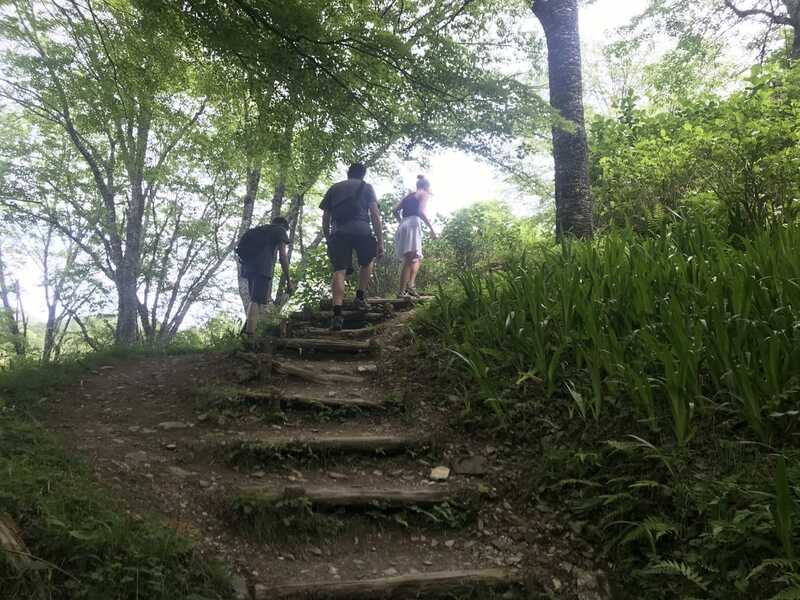 As you start to make your way from one level to the next (don’t think mountain climbing here – it is a moderate climb and very easy if you are used to walking) halfway up the mountain you will come to the beautiful town of Yoshinoyama. I have read in other blogs that it is super touristy, but I didn’t think so, I thought it was charming. Perhaps that’s because we were there out of season and maybe I’m getting older so enjoy twee Japanese towns. In the spring Yoshinoyama sees hoards of visitors, all clambering to get the best spot. This is where you need to listen carefully. What better way to see these vibrant pink trees than to get as high up as you can? Go to the visitor area at the bottom of the town and then, instead of following the crowds, look for the white sign that says ‘walking track’. Follow the path, up, up, up. You will come to a graveyard, there is absolutely no one around. Find a nice spot overlooking the trees and relax. Watch from above as the hoards of tourists look for a parking space for their car. It’s very entertaining! 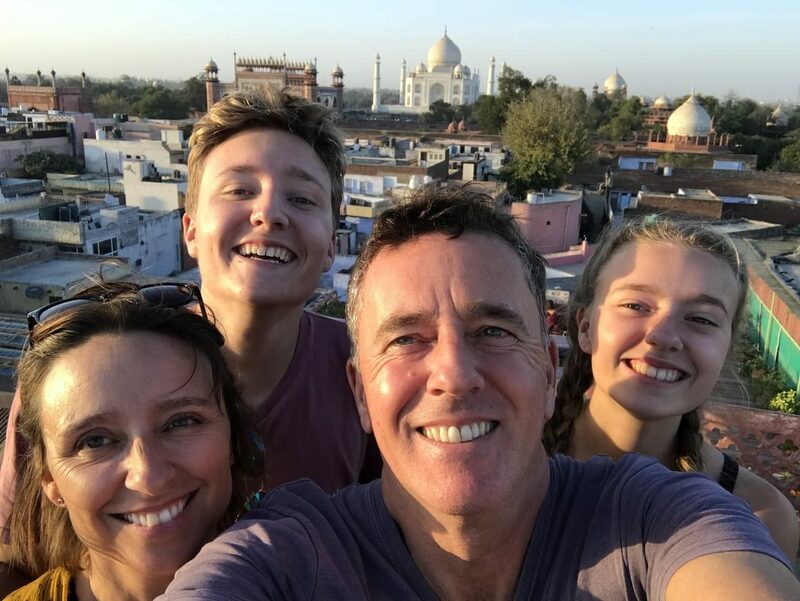 Finding the best spot to view not just the cherry trees but the circus that is happening in the tourist car park! A fabulous way to enjoy a picnic! Couchsurfing. What it is and what it isn’t. I didn’t know anything about Carp until I visited Japan. 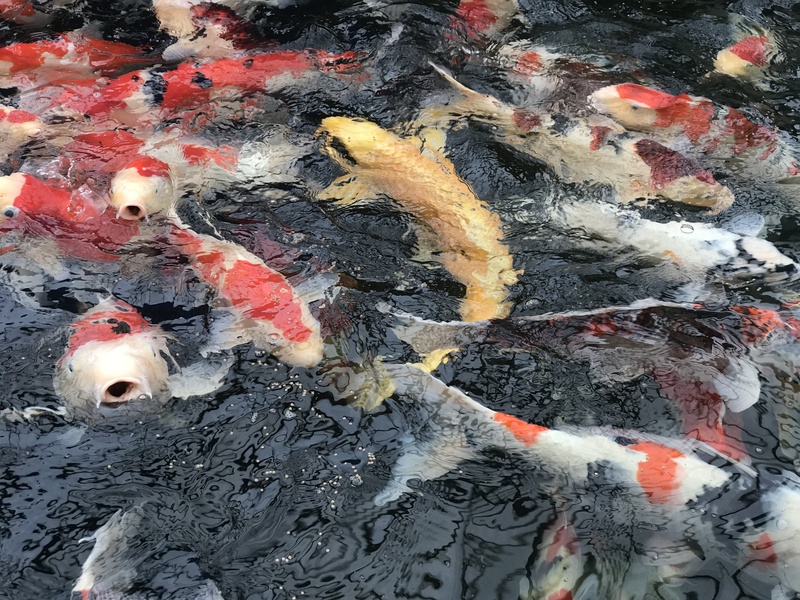 We stayed with a couple who had a pond in their garden and it was filled with these beautiful, large, bright orange fish that I now know are called Carp. (don’t judge me; I didn’t listen in school). I wondered why our host had security cameras aimed at the pond; it was then that I learned how valuable these fish are to the Japanese people. Sitting in that mans pond was the equivalent to three Ford Fiestas. Think racehorses but with fins and wearing an orange jumpsuit. That’s how prized these fish are. Once I found this out I was desperate to see more Carp. I was curious as to what made one fish worth $100,000 (yes, really) more than another. Carp farms in Japan can be found in the countryside. The farm that we visited was outside of Tokyo. Go to a Carp Farm. Ask if you can look at the fish and if possible, do as we did and let the farm owner explain to you the worth of each Carp. Watch the excitement in the farmer’s eyes. There is nothing better than talking with a person who is passionate about their subject, and Carp farmers are certainly that. We were allowed to feed the fish and we learned an incredible amount. Best of all? It was free! Get away you yellow traitor. You are not worthy to be in this pond. So Far So Good, But Are You Sure The Next Suggestion Is Not Going To Break My Japan Budget? Everything we did, we did on a budget. You don’t need me to tell you that Japan is expensive, but there are certainly ways that you can enjoy yourself in this country without breaking the bank. You are going to love my next and final suggestion. As much as kids enjoy looking at cherry blossoms and doing long hikes through mountains, they are young and adventurous. What they wanted most from Japan was to be thrilled. Like everything in Japan, the Japanese theme parks are perfect; clean, calm and super safe. If you have ever travelled on a Japanese train you will know what I am talking about. The theme parks are no different, you almost feel guilty for not taking your shoes off as you walk into one of their immaculate public bathrooms. When I was planning the trip I had looked into the prices of Tokyo Disneyland, not only could we not afford it, to be honest, I just couldn’t face it. We have been to Florida Disney Land and that is enough. We didn’t want Micky, long lines and an empty wallet; we wanted to ride the tallest wooden rollercoaster in the world, scream our heads off and still have enough money for ice cream. One of the best things that we did while we were in Japan was to experience a Japanese theme park. They really are like no other in the world. 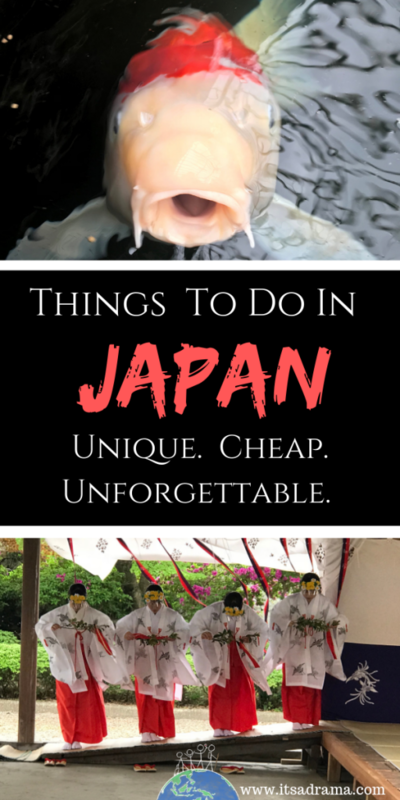 I told you at the beginning of this post, if you are looking for things to do in Japan then you need to have a head for adventure! And heights. Nagashima Spa Land is an amusement park in Kuwana, Mie Prefecture, Japan. We were staying in Nagoya and looking for things to do when we were told about this unadvertised theme park. If you are planning a trip to Japan DO NOT miss this fabulous experience. You can take the train but that’s not as cheap and as easy as the bus. Here’s what to do: Go to the Meitetsu Bus Station (located just outside the Nagoya railway station) and get a bus directly to Nagashima resort. Don’t worry, everyone on that bus is going to the same place as you are and to our surprise, the driver spoke a little English. You can’t go wrong, just ask. Click here for the timetables and the cost of the bus. According to a report carried out by CNN Travel, the Nagashima Spa Land was number 19 in the most visited amusement parks in the world, having a whopping 5.93 million people passed through the gates in 2017. Well. I don’t know when all of these people came, but they certainly weren’t there when we visited. We made a vlog of our experience there you will see for yourself, the park was empty. It was fabulous! I suggest you visit off-peak season, we were there in early May, and I don’t know if we just caught it lucky but as I said, you will pretty much have the place to yourselves. Nagashima Resort is said to be the best theme park for roller coasters in western Japan. 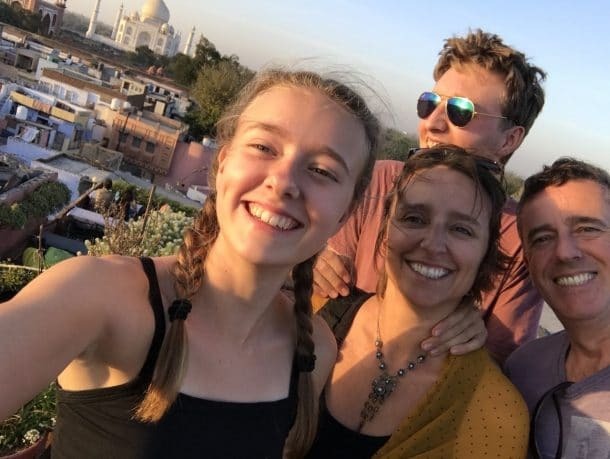 There are over forty rides at the resort ranging from thrill seeking, sky topping rollercoasters, kids rides and the icing on the cake – the huge Ferris wheel. Ride the Steel Dragon and scream for your life. I am not kidding; it was the terrifying ride I have ever encountered, but, like everything in Japan it felt incredibly safe – almost a little too over engineered! There are places to eat; we got burgers and fries – come on, you are at a fairground in Japan, you can’t eat noodles all of the time. 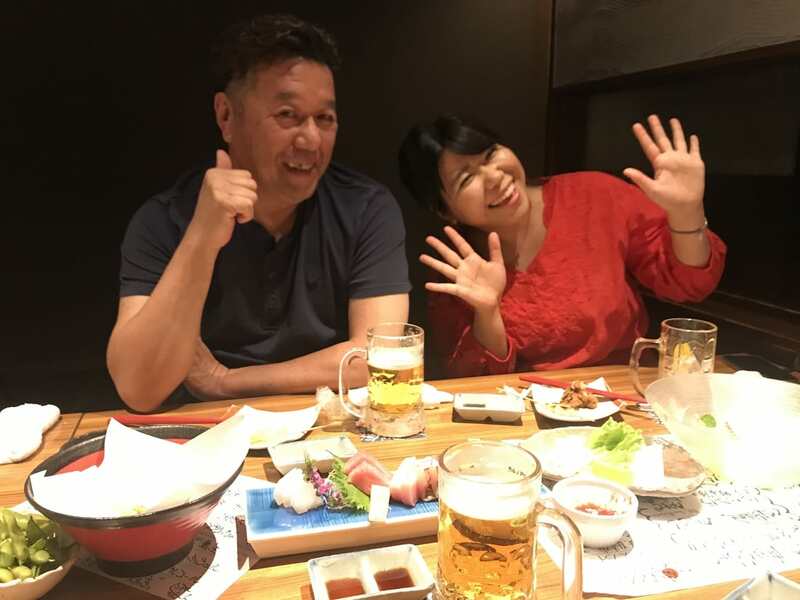 If you are visiting Japan with kids or, you would like to experience how the Japanese people let their hair down, then please, do not miss this fabulous once in a lifetime experience. 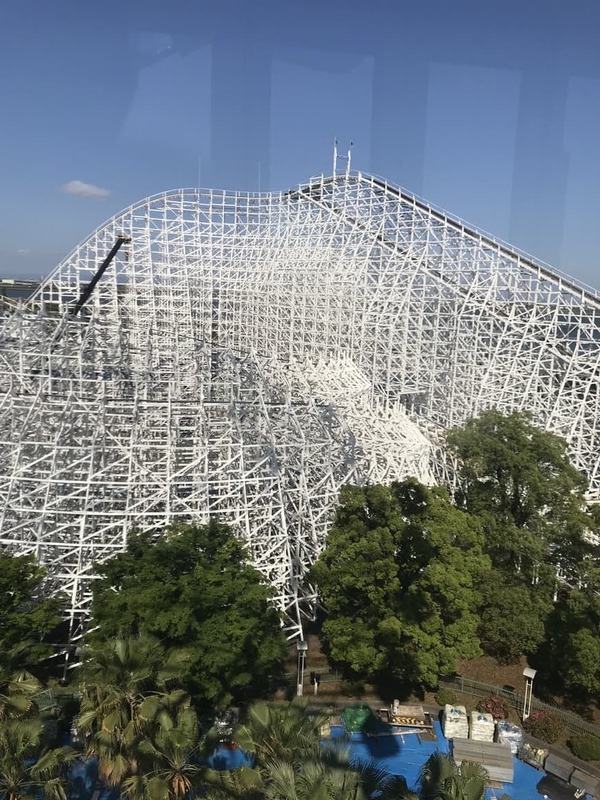 While Nagashima is not Disneyland Tokyo or Legoland it is an old style new engineered, underrated, thrilling, and immaculate Japanese theme park that will leave you breathless – certainly, if you ride the cray rollercoasters then literally, yes, it will leave you breathless. There you have it then, my top things to do in Japan when you want something other than the usual fare. Be brave, do things differently while you are in Japan avoid the crowds, get off the tourist track and you will discover a Japan that not many people know about. Enjoy!